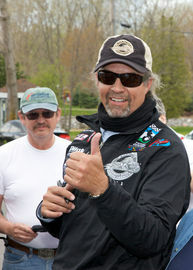 Kyle Eugene Petty is an American stock car racing driver. Now retired, he formerly competed in the NASCAR Sprint Cup Series, and is currently a co-host for NASCAR America, which is on NBCSN. He has also commentated for TNT's NASCAR coverage between 2006 and 2014. He is the son of racer Richard Petty, grandson of racer Lee Petty, and father of Adam Petty. He and his wife have two other children. He last drove the #45 Dodge Charger for Petty Enterprises, where he formerly served as CEO. He appeared in the 1983 Burt Reynolds movie Stroker Ace. Petty was born in Randleman, North Carolina. In 2012, Petty was awarded the Lifetime Achievement Award from the Diecast Hall of Fame.